Shacktown Falls, a photo by waterfallshiker on Flickr. I have seen this waterfall called several different things. 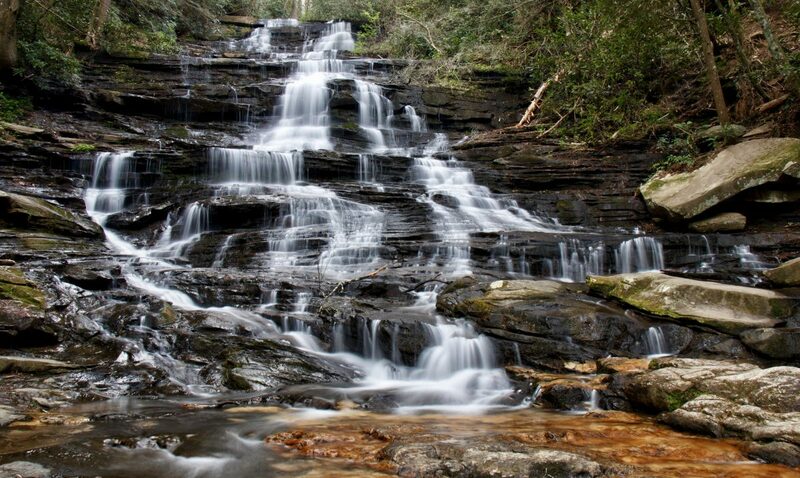 “Waterfall on North Deep Creek”, Styers Mill Falls, and Shacktown Falls are all common names for this beauty. I have heard Shacktown the most. Since this is what most people call it, I will as well. It is only about 10 feet high, but across a very wide stream with a rather large water flow. It is quite an impressive site, considering that this waterfall is not located in the mountains. 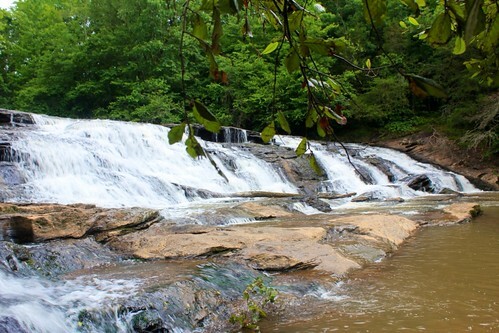 It sits in the foothills in a place known as “Shore-Styers Mill Park”. This is pretty primitive for a park, so far there is not much there except a small pull-out to park, rough path down to stream, and a small wooden observation deck. If you want the best view, you will have to walk down to stream. This area is rich in history and has been the sites of several mills, all powered by the falls. There are plans for a expansion of this area, but a big problem must be solved first. It seems the local residents do not think too much of their historical jewel. There is constant graffitti, and trash being dumped by vandals . This and a constant supply of beer cans make this a trashy area. It is such a shame. There are two stone wheels that were in use during the mill era on display, located near the observation deck. The historical pieces are covered with spray paint. All trash aside, it is still a very nice waterfall!! Once day, I hope to see it in better condition. This waterfall is very easy to get to. Just southeast of Yadkinville, take exit 253 off of US 421, turn and drive under highway to Shacktown Rd. Turn left for maybe 1/4 mile and take a right on Styers Mill Rd. The waterfall will be just a short ways down the road on your left. Thank you for the nice comments Sloan! Has just been added to my “to do” or “ta da” list.. Thank you! 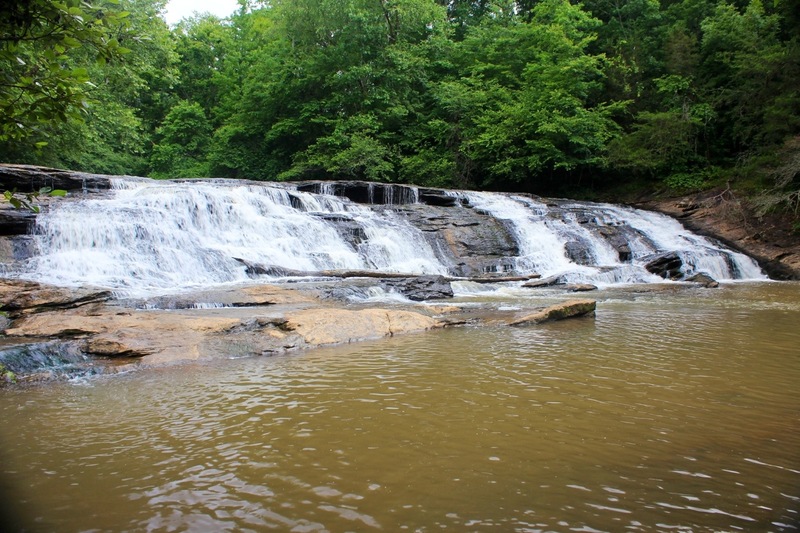 I LOVE these falls and they are only 15 minutes from my home! When I moved here 10 years ago, I was pleasantly surprised to find that such a natural treasure was right on my doorstep. I agree completely that the local residents don’t seem to treasure this lovely spot. I am so saddened to see the trash and graffiti, and it appears to get worse every time I visit.